Last weekend was the start of the annual Hot Docs Canadian International Documentary Film Festival in Toronto. Stop! Don’t click on the x! I know what I just said could make pigs plunge headlong over the edge of a cliff but I promise I’m going somewhere with this. Hot Docs is the largest documentary film festival in North America. It runs for 11 days showing 170 movies from 40 countries. Audience members are given a ticket on which to judge each film viewed. I know I didn’t redeem myself with that last bit of info either but bear with me . . . . So, being filmies, Ric and I jumped at the opportunity to attend. Unfortunately, without our Chuck Taylors we jumped late and low. We spent tens of minutes perusing the catalog of films, carefully selecting those that were most socially profound . . . and the ones that were showing on Sunday afternoon or Saturday evening after 4:00 . . . and playing at Cumberland 4 theater . . . . and offering Jots at the snack bar. The world was our oyster. We went online to buy tickets for the narrative of Benazir Bhutto’s remarkable life. Sold out. We tried again with a powerful story of the West Beirut survivors of a 1982 Israeli bombing. Sold out. The unfinished Nazi propaganda film about Jewish life in the Warsaw Ghetto. Sold out. “My Perestroika”, the trials of people raised behind the Iron Curtain. Sold out. How could this have happened?! It was still a good 2 days before the festival! Could there be that many other pseudo intellectuals living in Toronto? And then, a glimmer of hope. Nestled in amongst the do-gooders, tree huggers and truth seekers, we found a film so entertaining that we were laughing out loud before the opening credits. We found “American Movie”. 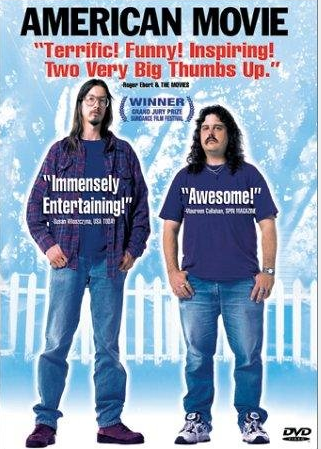 Winner of the Grand Jury Prize at Sundance in 1999 “American Movie” tells the tale of Mark Borchardt from Milwaukee. Mark is a horror film devotee from way back and has a history of making his own brand of homespun horror films with inspiration from the likes of “Texas Chainsaw Massacre” (the original version of course) and “Night of the LIving Dead”. Mark is low on funds, hounded by the IRS, his ex-wife, and the local phone company and yet, he still thinks it’s a good idea to resurrect and complete “Coven”, one of his many abandoned short film projects. And with the help of his rag tag team of local actors they set off down the yellow brick road toward Oz. Mark stars in the film as well as producing, directing, and editing. He’s in his late 20’s, living with his parents, drinking beer and smoking pot to help release his creative juices and avoid seeking legitimate employment. And that may explain why his fashion choices appears to be leftovers from 1975. He regales the audience with diatribes on dead folks, relationships, and his own spirituality which is described as a happy blend of 1/2 Christianity and 1/2 Satanism. Mark’s right-hand-man is Mike, a sweet, childlike fellow who looks suspiciously like Hagrid or maybe that dude from Kansas (my first concert and one of the great rock bands of all time). Mike is a supposed reformed drug abuser and alcoholic although the reformed part seems a little far fetched. Giving him the benefit of the doubt I can only assume that he was one reefer too late when he decided to give up the habit. Mike shares a poignant tale of an acid overdose that lands him in the hospital. When he wakes from his trip down Psychadellic Lane he recalls a dream he had while he was out about a baggie he had on his person containing his last hit of blotter’s acid. Face lights up! It’s not just a dream. He gets out of bed to retrieve his hit, hoping to enjoy it during his relaxing stay at the hospital. Plans are foiled when the door swings open and in walks Mom . . . . . with the baggie in her hand. I’m not sure if that was the last straw that turned Mike around but I would hope it might have been a clue. Then there’s Uncle Bill. I think Uncle Bill is about 150 years old and he hates parting with a buck. Apparently he’s saving for the afterlife, hoping to use it as a downpayment on some finer digs. He’s living in a dilapidated trailer but appears to be the only dude in town with enough money and dementia to fund Mark’s film projects. Uncle Bill is a crotchety old guy who reminds Mark at every turn that he’s an idiot but still hears the sound of applause and can’t resist playing a part in the film. About 64 takes later, Uncle Bill successfully delivers his single line. Look, I could go on . . . and on . . . and on. The characters – and by characters, I mean the real life people who take part in this debacle – are monumentally delirious, hilarious and unbalanced, but you just can’t help but love them. They’re problem solvers (note: scene where Mark has to ram another character’s head thru a kitchen cabinet door), fun lovers (note: scene where Mark gives 150-year-old Uncle Bill a bath and gets him drunk on Peppermint Schnapps) and philosophers (note: every scene wherein Mark opens his mouth). If nothing else, you’ll feel better about your own dysfunctional family after an hour and a half with the exploits of the Milwaukee Borchardts and their troupe of nutty players. This is a Golden Macaroon in my book and one that will soon have a place of honor in my own DVD collection! “American Movie” is available on Netflix.com as well as it’s Canadian counterpart Zip.ca.